More than 100 students created learning materials for Jumpstart an early education nonprofit organization in D.C. The activity was one of eight service projects completed by Greek life for the first annual Greek Day of Service. The Continental Ballroom of the George Washington University’s Marvin Center was a flurry of creative activity on Saturday morning as more than 100 GW students used construction paper, paper mache and markers to create alphabet books, piñatas and other teaching tools. The beneficiary of the energetic volunteers was Jumpstart—an early education nonprofit organization that serves more than 800 children in the D.C. area. The crafting session was just one of eight service projects that the GW Greek life community completed during the first annual Greek Day of Service. In all, volunteers completed 2,500 hours of service. Ms. Yancey said that student volunteers are essential to the work that Jumpstart does with youth in the community. GW Jumpstart Site Manager Rochelle Yancey said that the work done by student volunteers is integral to the mission of Jumpstart. More than 650 students representing the GW Inter-Fraternity Council (IFC), the Multicultural Greek Council and the Panhellenic Association united for the student-led service day that capped off Greek Week—a friendly competition between fraternity and sorority teams held annually. After a short opening ceremony and breakfast on University Yard, students split into groups for their tasks. Aside from the creative work for Jumpstart, the students’ efforts included planting flowers and running a clothing drive at Kunzang Palyul Choling, a Buddhist temple in Poolesville, Md. Others assisted the Foggy Bottom Association with a community clean up and helped to manage invasive plant species at Dumbarton Oaks, among other activities. The students returned to the Foggy Bottom Campus and convened on Kogan Plaza for the announcement of the Greek Week winners who were selected based on the total number of points earned during the competition. The Chi Omega, Zeta Beta Tau and Zeta Phi Beta team earned a first place win. 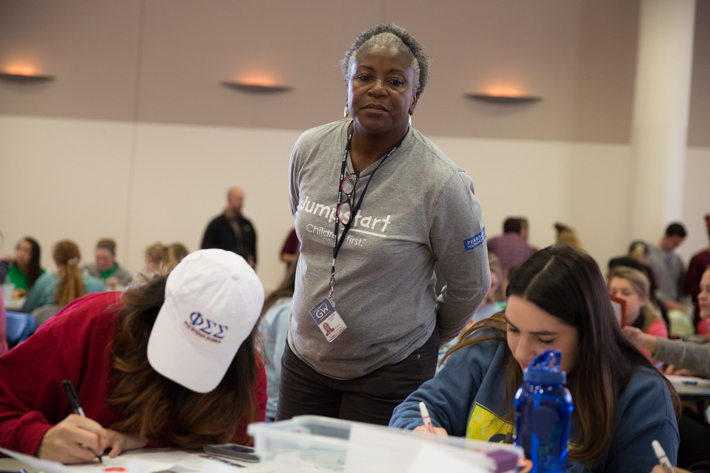 Maurice Smith, the coordinator for academic service learning at the Center for Civic Engagement and Public Service, commended students on Friday as they started their service with a canned food drive and sculpture contest. The students collectively donated 4,000 canned goods to the food bank at St. Mary’s Court and Miriam’s Kitchen. 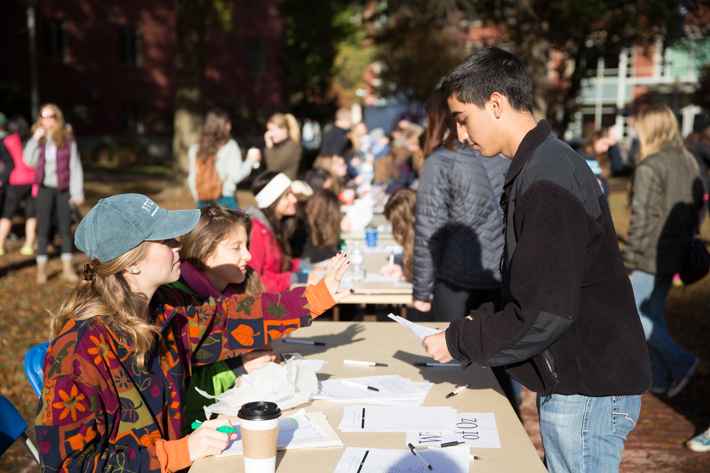 Mr. Smith helped the students organize the event by surveying site coordinators who participated in Freshman Day of Service in August to see whether any were interested in working with student volunteers from GW’s sororities and fraternities. Mr. Smith added that as a combined service project for all three Greek councils and their affiliate organizations, the event was the largest-scale Greek life community service effort in the D.C. area. More than 600 students representing all three Greek life councils volunteered at the first annual Greek Day of Service on Saturday. Volunteers completed more than 2,500 hours of service. According to Marcella Cervantes, a CCAS senior and member of Lambda Pi Chi Sorority Inc., the volunteer effort also provided an opportunity for students from different Greek organizations to meet and work together. Erin Brainard, a senior in the Elliott School of International Affairs and the Panhellenic Association vice president of community relations, said she was not surprised to see so many students support the event because service is integral to Greek life at GW.